I promise I did not intentionally abandon my blog for over a week. Well, there may have been a bit of avoidance and lack of blog worthy material (as if!) followed by a road trip to Oklahoma with my girls for a long weekend of loud laughter, eating like truck drivers, pedicures, being silly (who? us?) and shopping. It's worthy of its own post, so stay tuned. Yesterday, in an attempt to work off 1/16th of the calories I consumed over the past four days, I was in the middle of getting my TurboFire on with plans to add on abs and some weights when the phone rang. It was Annelise's school telling me that she was in the office with a stomachache, no fever, but general malaise and drama (this I discovered when I talked with her a few minutes later). I am not a fan of faking sickness but I am even less a fan of puke (not that she did that or anything). She had approximately 1.5 hours left in her school day and did everything she could to convince me she could not bear to soldier through the rest of it, the key parts included using her most pitiful voice ever and vague descriptions of random stomach pain along with the inability of a peppermint to cure her. I even told her that if she came home she wasn't allowed to have any fun and she still wanted me to pick her up. So I picked her up. And approximately 20 minutes later, after...you know, a longer visit to the loo, she was feeling like a new person. I must admit, I was irked. This morning I decided I would go to HEB right after taking Annelise to school instead of dragging her along after I picked her up (she hates that plus the store is way more crowded) so I had to put on actual public worthyish clothes instead of the t-shirt I slept in and shorts. I also sat in my car for a minute after parking to apply my mascara. I felt strongly that I needed to have my eyes on to accomplish my task. This photo shows my left eye done and my right eye jealous. I alternate between this Rimmel Scandaleyes, L'oreal Double Extend Tubes (love, love, love, but it takes a bit longer to put on the two different tubes) and Maybelline Mega Plush Volume Express, which I think they lied about the whole mega and plush thing happening. 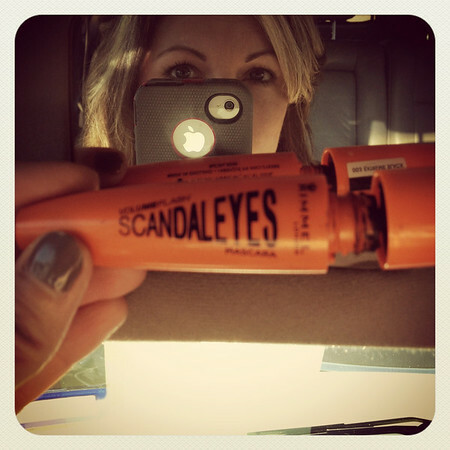 So I'm wondering...what's your go to, always fabulous, lengthening, thickening, crazy good mascara? It also shows my slightly chipped thumbnail (several of my other nails are also in the same boat which makes me question my commitment to painting my nails since it never seems to last very long). I painted my nails last Wednesday with a base coat of Sally Hanson hardener (my nails are thin and very peel-y lately and not only does this frustrate me, it worries me that I'm lacking some vital nutrient or have a thyroid condition or terrible disease, followed by two coats of Chinchilly by Essie, a fun grey color and finished with a Sally Hansen top coat. And they started to chip, like, by Saturday. Ugh. So I'm also wondering...what's your best no-chip (is that possible? ), longer lasting polish routine? Any advice for thin, peeling nails? Oh yes, the stomach ache drama......wait til her monthly fun starts. Daughter #2 would get very nauseous for a day or two (just like her mama) and middle school was a nightmare some months. I have almost no lashes so I am always trying new ones. I am currently loving Almay's One Coat. I dont like flaking and this is doing well. Do you follow EmilyNoel83 on YouTube? She just did a mascara comparison video. Love her ~ she's a newscaster and gives great tutorials. I've been loving Revlons extra life no chip top coat....it really seems to help stretch chip time. I usually use Sally Hansen's Insta-Dri top coat over polish to dry and then put one coat of the Revlon on top. Road trips are fun ~ what a blast with good friends! A true blessing! Kelly Hampton posted this on instagram to get a diy shellac looking manicure. I've tried it out and am super impressed, you will definitely get at least a week out of good looking nails! Do a base coat of Nail Magic, two coats of your color, then a top coat of Out The Door. She suggested putting another coat of OTD on later in the week to keep it looking fresh! One tip though.. make sure you give enough time for each coat to dry well! NM & OTD can be found at Sally's Beauty Supply. My mom also used the Nail Magic repair polish on her nails. They were very brittle and are now nice and strong! I love Lash Love mascara by Mary Kay. It is $15. It is the only mascara I have ever used that I felt like actually made a difference in how my lashes look. I have fairly strong nails. I don't paint my fingernails too often because of the chipping. When I do paint them, I prefer to use Sally Hansen Complete Salon Manicure polishes. I still put a separate topcoat on too, for extra chip protection. It seems to hold up fairly well. I use Essie's 3-way glaze as a base coat because that is what Kate from The Small Things Blog uses. Not sure if it's the end all, but I have no complaints. I then use Seche Vite as a top coat. Go right now and buy it. I can do my nails 20 mins before bed and I have NO bed bumps. It may have changed my life. It wouldn't let me say more than the above for some reason. Anyway, since using those two products together, my polish lasts until I'm sick of the color. Im having so much more fun now that I'm getting awesome results. Nine. You Know, The One Before Ten.